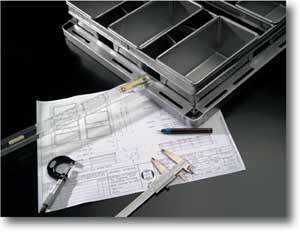 All Mackies' pans and trays are made from STEELUMAT™, our name for aluminised steel. STEELUMAT™ is manufactured from cold rolled steel, hot dipped with an aluminium silica alloy and rolled to produce a low sheen, silver-grey surface. This material’s physical and chemical properties withstand the hostile environment in today’s intensive production bakeries. Under normal bakery conditions and with proper care and maintenance, pans and trays manufactured from STEELUMAT™ produce superior quality baked foods throughout the life of the utensils. Mackies also offers an extensive range of ancillary items and kitchen essentials suitable for the baking, hospitality and catering industries as well as the home chef/baker. All items are manufactured from high quality materials and designed fit for purpose. Mackies' bakeware is processed with state-of-the-art pan conditioners and release coatings. Their various qualities are suitable for, and work efficiently with, a range of bakery products to give you flexibility of choice. We are happy to advise you on the most appropriate finish for your application. All Mackies' pan conditioning and release coatings are designed to eliminate the process of “burning in” pans. MackEZE™ is a fluoropolymer resin that ensures excellent product release, a high standard of hygiene and excellent return on investment. When you choose MackEZE™ you get all the benefits of DuPont TEFLON® certified non-stick surface. Mackies is the only DuPont licensed special purpose applicator of industrial bakeware in Australasia. MackEZE™ is available on most Mackies bakeware by request. Bake-Rite® with PANGLAZE® is a well proven combination of pan conditioning and release agent. Pans are factory conditioned to produce high quality product from the very first bake. Bake-Rite® and PANGLAZE® are standard on most Mackies bakeware. RK97+® is a black exterior coating often used in conjunction with Bake-Rite® and PANGLAZE® to promote golden brown loaves from the very first bake. RK97+® is available on most Mackies bakeware by request. Mackies offers a range of optional pan features that may enhance the performance and/or life of your bakeware. Your representative can discuss the options relevant to your requirements. • Pans and trays should not be subjected to "burning in" prior to use and empty pans should never be placed in hot ovens. Putting a dough piece in every pan is recommended to avoid damage to coating and pan material. Bake ware and non stick liners should not be placed directly on oven element or open flame. • Daily use of a limited amount of good quality vegetable oil when using Panglazed pans and trays including perforated products. MackEZE PLUS coated pans and non stick liners require no oil lubrication. • After use, pans/trays and bakery release sheets should be wiped over with a damp cloth and stored in a dry area. Do not use harsh or abrasive cleaners. Perforated items require particular attention so that holes do not become clogged with grease and/or ingredients build up. A soft brush is recommended. Pans/trays should not be immersed in water or other solution and never stored in the prover. A humid environment is a sure way to invite rust and coating breakdown. • Excess oil will result in heavy carbon build up that will lead to spotted or discoloured product. Dusting flour, seeds and other ingredients will adversely affect the life and release qualities of the coatings and careful removal of such in the cleaning process should be carried out so that pan life is not overly compromised. • Pans/trays should be stored in racks or cross stacked where possible to prevent damage from nesting. Bakery release sheets should be stored flat or rolled. Scrapers and other sharp objects should be kept well away from pans, tray and liners. Care should be taken in the de panning process so that pans/trays are not subject to harsh treatment leading to denting and pan dislodgement from brace. • All chrome and mild steel products should be soft brushed free of flour dust and seeds and wiped free of excess build up. They should not be immersed in water or other cleaning agents that would induce coating breakdown or rust. • Stainless steel items may be washed with warm soapy water but should be rinsed and dried off prior to storage. Both Australian and international clients regularly send their pans to Mackies Pan Maintenance Division because it makes good economic sense. Please note that the wonder release coating which is universal in its application and able to withstand the rigours of the small to medium bakery is yet to be invented. The coatings applied to Mackies bakeware and liners will eventually fail due to thermal breakdown. Thermal breakdown happens gradually as pans are subjected to baking temperature variations. Each time pans are heated and cooled, microscopic cracks form in the coating structure. Eventually the cracks enlarge to allow build up of bakery residue compromising the coatings release capability. Thermal breakdown can be accelerated due to excessive heat greater than 245◦C over a prolonged period of time. It is important to maintain even oven temperature below this and eliminate empty moulds/impressions running through the ovens. Please remember that these points are offered as a guide only. The success of any release coating will be determined by the ability of the baker to adjust his/her methods or the acceptance of changes needed to meet the performance requirement of the coating. Bake-Rite®, PANGLAZE®, MackEZE™, KLEENbake™ and RK97+® are registered trademarks of Mackies Asia Pacific Pty Ltd.